Our opening club night was blessed with dry though somewhat blustery weather as we got into our stride for the season. 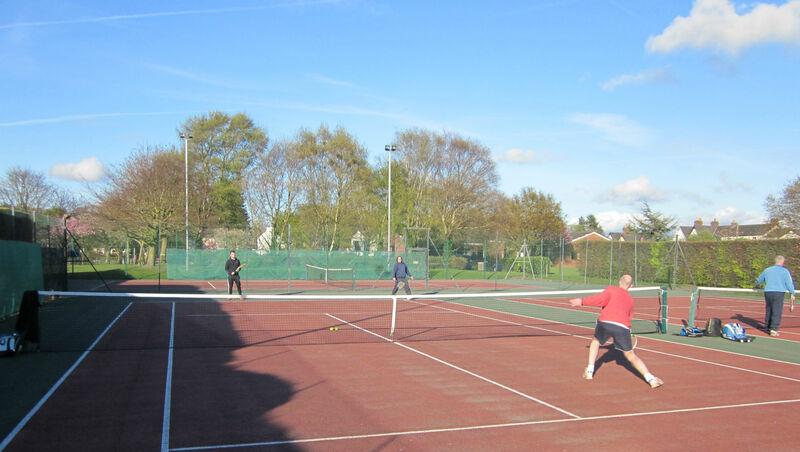 It was good to see that a number of prospective tennis players joined us for the evening and hopefully they will have been encouraged to visit us again. Now the season starts in earnest with teams preparing for the start of fixtures in the Southport and Liverpool leagues. Last Thursday the mens team had a fine evening and got nearly two hours of practice without needing to use the floodlights. It was interesting to see that the first floodlight on the third court had already been converted to LED. It’s not easy to see, but the old sodium light fitting has been removed and replaced. Such is the technology nowadays, the new LED lights don’t actually look like lights at all. Hopefully the weather will allow the conversion of the remaining lights before matches begin. This entry was posted in News and tagged Aughton, Town Green by towngreentennis. Bookmark the permalink.